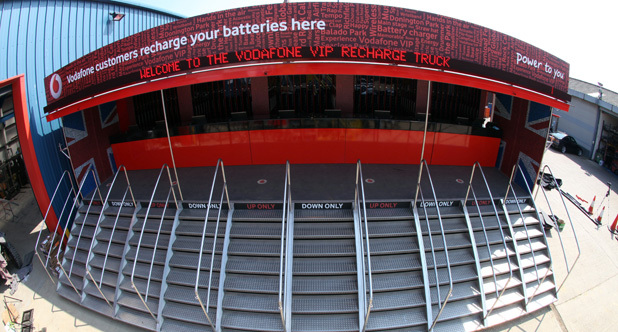 You may remember Vodafone’s VIP Recharge Truck from last year, a 44-tonne behemoth that visited some of the UK’s biggest festivals to charge as many as 2,000 mobile phones at a time. This year it’s been given an impressive upgrade. Heading to festivals in the coming months, the truck has been outfitted with built-in DJ booths and the mobile operator has tightened security with the inclusion of infrared Palm Vein readers. The new hand-scanners are designed to make handing over your phone more secure. Last year, Vodafone employed two-factor authentication with photos and wristbands, but the bands were often lost and staff were faced with making judgement calls on whether the person was who they appeared to be. Now, when a phone is placed in the truck for a much-needed charge, festival-goers slide their hand into the palm-shaped reader, which will then map the blood vessels under the skin. It utilises the same technology used in Japanese banks and it takes just a couple of seconds to process, reducing queues and making it easier for people to hand over, charge and collect their smartphones. It will be touring Download, Isle of Wight, Global Gathering, Latitude, T in the Park or Reading and Leeds festivals, so if you are attending one of these events, it’s almost certain that you will see (and possibly take advantage of) Vodafone’s giant VIP truck.